In 2005, Paul and Vince took an even bigger leap and decided to expand the sell out indoor show which only allows for a maximum capacity of 2500 metalheads, to hosting an Open Air festival alongside the now well established indoor festival which would allow for up to 10,000 metalheads, hence the birth of Bloodstock Open Air. 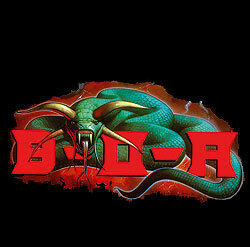 Paul says the logo for BOA was fairly easy to develop, but he still wanted to keep the original concept of the ram. Once the layout for the lettering was decided it was then he came up with the idea of the metamorphosis from S-tan to S-tan plus snake. As the Bloodstock designs were quite detailed Paul decided to simplify the BOA design for it's first appearance. There is a huge financial strain to put on two top notch metal festivals, but Paul and Vince were so commited to bring their dream to reality and realised the UK's need for a Open Air show that could still retain the friendly Bloodstock atmosphere that the indoor show had become renowned for. At this juncture Wacken showed huge support and leant their European marketing muscle to help spread the word of Bloodstock and offered sound advice to Paul and Vince to help build for the festivals future. Sebastain Bach (ex skid Row) was a superb headliner for the Friday with Mostly Autumn, Breed 77 Gothard and Panic Cell. The headlining slot for the Saturday had to be Children of Bodom as they were so well received at Bloodstock in 2004. Followed by previous Bloodstock band Paradise lost, with Edguy, Evergrey, Masterplan, Humanity and Fourwaykill.